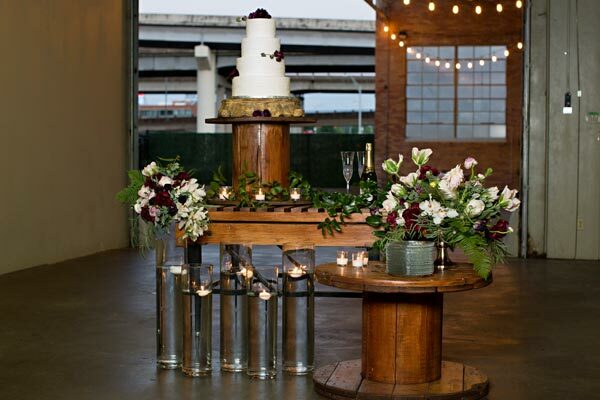 The Silver Lake Ballroom lends itself as the perfect special event venue. Silver Lake Ballroom is located in a three story Art Deco building located in Shreveport, Louisiana. Built in 1931, this event venue impresses timeless style both inside and out. The bright, airy rooms feel spacious, even when they are filled with guests. The Silver Lake Ballroom has hosted corporate events, film shoots, bar mitzvahs, luncheons and a host of other special celebrations. We enjoy providing an energetic environment for photo shoots to many of our clients and photographer friends. Security, a doorman and a venue manager will be onsite during your event. Silver Lake Ballroom will provide additional event staff and vendors if needed. There is a fully-equipped warming kitchen onsite. Street parking and on-site parking lot are available. Emily Wilkins, our Venue Coordinator has a genuine passion for people and making events seamless. Some of her best qualities are being organized, adaptability and showing accountability. She shows pride in her work and has determination to succeed. Please take time to view our photo gallery. ​The Hunter building was built in 1931 by Sam and Joe Hunter. This Art Deco building was originally home of the Hunter Oil and Investment Company. A neighbor, Huey P. Long, built another Art Deco building in that same year, The Louisiana State capitol in Baton Rouge. The building's first floor housed Central Motors, The Chrysler, Dodge, DeSoto dealership. For years the building sat empty, but now is transformed into the Silver Lake Ballroom. The name Silver Lake also has some history. In the late 1830's before the great raft on the Red River was removed, the vast Silver Lake covered much of what is present day Market Street and Youree Drive. The Hunter Building sits in what was once part of Silver Lake. The Silver Lake Ballroom is ideal for meetings and parties. With its historical elegance and original decor, it will fit many occasions. ​Many, many moons ago a stalwart brave wooed and won a lovely maiden of a hostile tribe. Fearing the anger of her father, they stole away through the palmetto swamps, past lagoons purple with iris and under live oaks flaunting ghostly banners of Spanish moss. Journeying northward they reached at last the spot where Shreveport now stands. There they built their wigwam, and lived happy in their love, and secure in the thought that they had eluded the pursuit of the father. One morning, when the curtain of fog rolled up, they beheld with dismay her father with a band of warriors, hideous in their warpaint. No time for flight, no chance for successful resistance, no hope of conciliation! In despair they petitioned the "Great Father" above and lo! the pure waters of a lovely lake lay sparkling between them and those who sought their lives. The old chief gave the sign of peace and farewell, and soon was lost to sight in the forest. 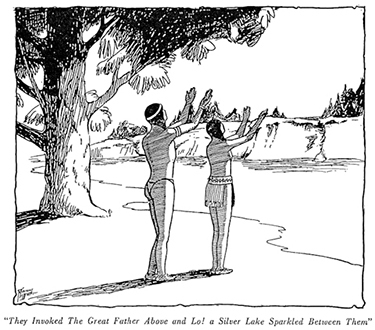 The young couple so miraculously saved, lived for many years on the banks of the lake afterwards known as "Silver Lake". This is the legend of the origin of that lake and also the tribe of Caddodahocoo, or the Caddo who called themselves "Hassiniai," meaning "Our Own Country" or people. For years the water extended up Crockett Street, often as high as where El Karubah Temple now is, during high water. There was a very high embankment where the L. & A. depot now stands. *This story has been handed down from generation to generation in a prominent family of Shreveport who will not permit their names to be given, much to the regret of the editor. Change, the keynote of the world's progress, has banished the Indian to other hunting grounds; has leveled the forests to factory sites, and drawn the waters off Silver Lake; paved streets, lofty buildings and car tracks stand now where once the silvery water smiled a blessing to the Indian lovers. Such is the legend of Silver Lake-and as you ride down Marshall Street will you give a smile and sigh for the romance of the long, long years ago. Caddo Indians-Section 25, Tp. 16, R. 16 West, 10 square miles to Grappe, a white man who lived with the Indians. They gave him this land to show their love and friendship they had with their father. The main Caddo Camp was on this section but the camp in Shreveport was at Ft. Humbug and one was on Arsenal Hill where the poor house is now and one was at Rocky Point. Mr.W. C. Agurs saw an Indian skeleton which had been washed up in Bossier City. The jaw bones were about twice as large as the man of today. This Indian was supposed to be a Caddo Indian.